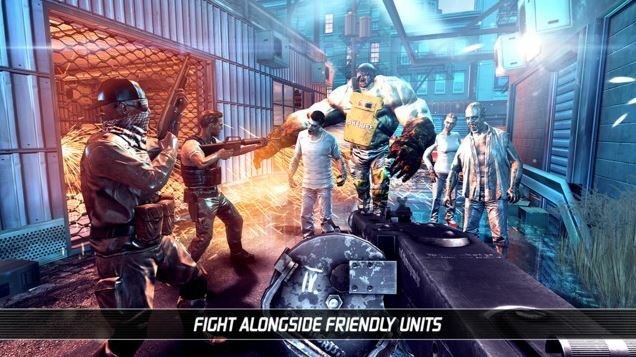 Madfinger Games has released the new Zombie Shooter app Unkilled for Android, iPhone and iPad. The developers are already very well-known, especially for their Dead Trigger series in this genre. Now they released Unkilled another app in this genre, which is also based on the Free2play principle. So you can download the game for free, who wants to move ahead more quickly, however, must pick up the in-app purchase. Currently it seem that zombies and undeads are once again very popular, because only recently we had presented you The Walking Dead: Road to Survival. Unkilled is honestly one of the best shooter conversions for mobile devices (Android, iOS), when it comes to the graphical and technical implementation. Since the app is almost approaching to console quality. Also impressive are the controls, that have been perfectly adapted to the touch devices. Although the controls change depending on the mission, but this is easy to learn. In general, you use your two thumbs to look around (right side) and move forward (left side of the screen). Bullets will be fired automatically, when the cross hair is on the Zombie. In other missions you are on a vehicle and you just have to look around and then fire with the left fingers. Of course there is also a story in the game Unkilled. So there is a zombie epidemic in NYC and you’re a member of the anti-zombie unit. Altogether there are more than 300 missions to complete, with numerous enemies and bosses waiting to be destroyed from you. In Unkilled you have a straight course as opposed to Dead Trigger, you must always complete a mission after another. You always have to upgrade your weapons to survive against the stronger zombies. When hunting you gain coins, which of course, you need to improve your weapons. Who does not want to renounce shooter games on their smart phone or tablet, we recommend Unkilled. The control system is perfectly designed for touch devices and the graphical implementation is almost console-quality (high-performance devices are required). Especially on a tablet makes such a game, of course, even more fun. Unkilled is free, but is funded through in-app purchases. You get more than 300 missions, more than 50 weapons and non-stop action. Moreover, numerous gamepads for Android, iPhone and iPad are supported. Numerous power-ups will help you to master even tricky tasks in the fight. Below the links to the download (Google Play Store, iTunes App Store). To play the app Unkilled you need to be at least 18 years. Unkilled is available for download in the iTunes App Store iOS. 8 You can install the game not only on the iPad, but also on the iPhone and iPad. Be the first to comment on "Unkilled: New Zombie Shooter app for Android, iPhone and iPad"